There was an important omission from our recent Competitions to Enter in January post for those keen to see their book in print. The Book Guild, in partnership with the excellent Writing Magazine will pick one winning book, which will be published by The Book Guild later in 2017, subject to the winner signing a contract with them. A 500-word plan of any promotional opportunities and how you see your book fitting into the marketplace. The closing date is 31 January 2017. Entry is £5. So, only two weeks in which to get your act together. The Book Guild will provide a copy edit, cover design, full text design and layout, one set of proofs for the author to check, ISBN allocation, bookshop sales representation, marketing to the trade and media and distribution to the trade for one year. Whew! Too good an opportunity to miss. PLUS the winner will also receive £1,000 in cash, courtesy of the David St John Thomas Charitable Trust. Paste each of the five required texts into a single document and enter through the website: http://www.writ.rs/winabookdeal which gives full details. You do not appear to need to be a subscriber to the magazine. 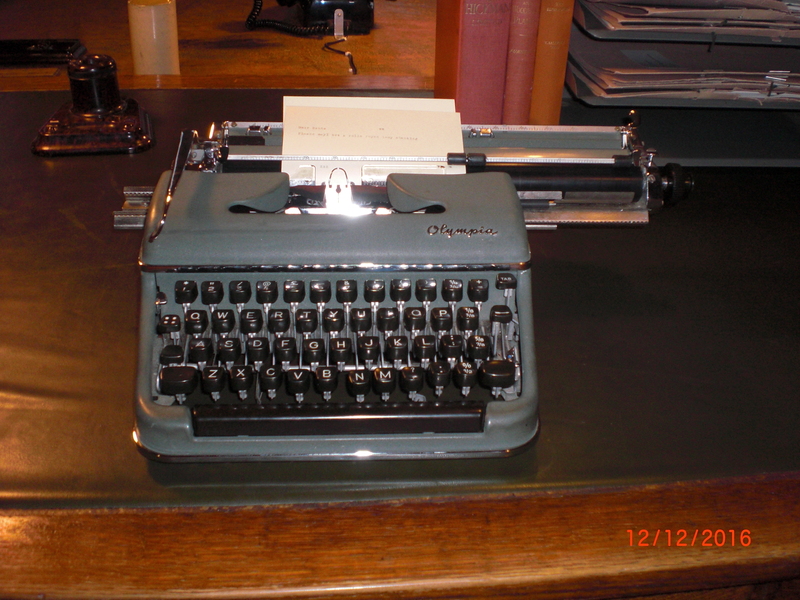 Time to hit the keyboard – though you should maybe use something more up-to-date than this old typewriter, photographed on a freezing pre-Christmas visit to Knole, where it sits in the office of the estate’s agent.